With the explosive growth of online news, businesspeople each morning are faced with a dilemma: how to quickly find the key articles and opinion pieces that will shape what business leaders know and think? Our solution: the RBJ Morning Roundup. Each weekday morning, RBJ editors comb a diverse array of media sources to deliver a tip sheet on the most informative news and analysis covering the latest developments in business, politics and much more. You don’t have to look any farther than your email inbox. 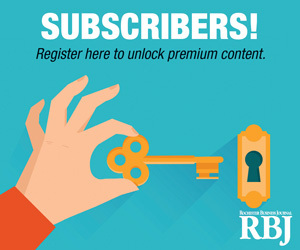 To receive a free subscription to the RBJ Morning Roundup, go directly to this signup page. By filling out one simple form, you will be entitled to receive all RBJ e-newsletters—including the RBJ Daily Report and RBJ Time Out—absolutely free of charge. To view a sample of the RBJ Morning Roundup, click here. At any time, if you want to stop receiving any RBJ e-newsletter, simply go to the link at the bottom of the e-mail that reads, “If you prefer not to receive these messages, visit this page.” Just click on the link.